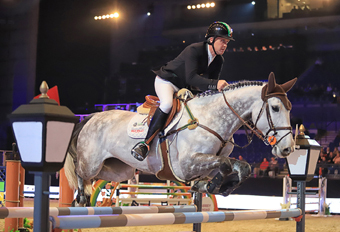 Irish star Shane Breen hailed the Liverpool International Horse Show as one of the world’s best after adding his name to this year’s roll of honour. Shane, riding Csf Vendi Cruz, won Saturday’s four-star speed competition, sponsored by Gornall Equestrian, in a time of 52.96 seconds. And the Sussex-based rider was quick to praise the standing of an event he has supported since its inaugural year. “I was here for the first year at Liverpool two years ago, and it is a great show,” he said. Shane produced a sparkling performance, guiding the nine-year-old mare home by more than a second from Egypt’s Sameh El Dahan, who shared the runners-up spot with Julie Andrews and Wilando B after they both clocked 54.30 seconds, while Amanda Derbyshire took fourth on Lady Maria BH. “I am delighted with the result,” Shane added. “Vendi Cruz has been knocking on the door for a while. And reflecting on his round, he said: “We can all leave a stride out and count the numbers, but I like to keep it tight.